thezentree - It's called a Dosko Campmate. I think they are from the 90's and getting a littler harder to find these days. Most people change rigs before they retire these Campmates. I found this one used 5 months ago or so. They can be found for around $150-$250 from what I have gathered. Love that ‘85, I have the exact same Campmate kitchen. It’s bulky, but efficient. It’s funny every time I see those old rigs, the sheet metal looks thin and delicate. That’s almost the best body style, I’m torn between that and the first gen Toyota 4x4s, it’s how I feel about the 67-72 GMs and the next gen Square bodies. Keep it forever! They are a big bang for the buck! 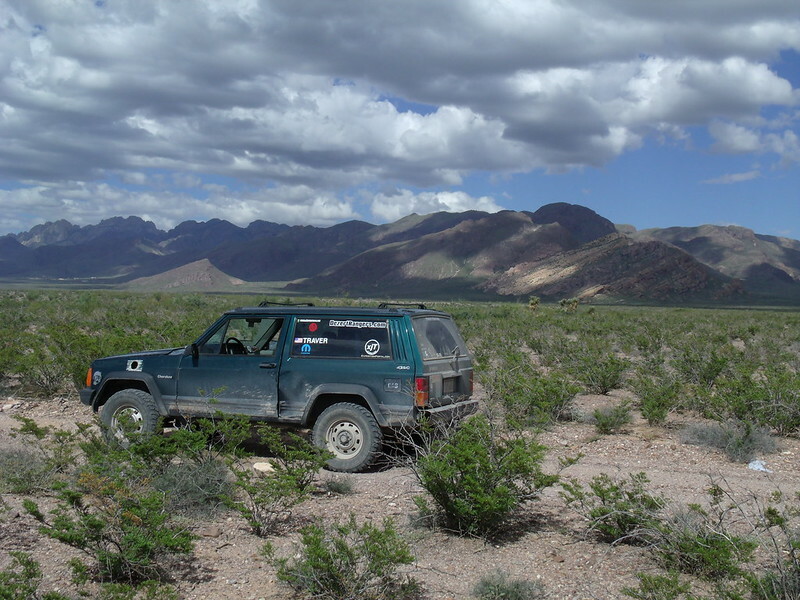 I find a lot of useful information on Expedition Portal but also a lot of shite; plain old camping trips re-labeled "overland expeditions" in vehicles costing more than recreational property, gilded in overwrought aftermarket accessories made possible by credit card debt. This is the only thread that I have read every single page, since I'm a dirtbag who has no respect for any political, religious or fraternal organizations and I prefer to live below my means and disgust the Joneses rather than keep up with them. I hope this gives me the proper credentials to join the dirtbag club. PS: @Crenshaw, mine is also creatively named "Whitey." This is such a wonderful thread, and truly inspiring. It goes to show that this is all about getting out there and exploring, not just the gadgets and gizmos. I'll throw in a picture of my old dirtbag machine. 1995 Cherokee, manual everything. Still looks basically the same, with the addition of a harbor freight roof rack. Sitting at 275,000Mi, original drivetrain. I had a '91 2dr 4wd Cherokee like yours in red. manual everything and factory carpet delete. best rig i ever owned. so basic and stupid simple. Those 2 door XJ’s are beautiful machines. @DJB1 love your truck man. i run a similar setup but a 2nd gen. are you running 235s? Thank you kindly, @shabba, I love it too. It's like a fun little ATV, but with cold air conditioning and comfy sleeping quarters. It is in fact on 235/85r16's. I'm convinced there's no better size for 4 cylinder trucks. Those tires just glide over rough roads when they're aired down a bit and the ground clearance even with a mild 2" suspension lift is excellent. I'm also still getting close to stock fuel economy, despite the E rated tires and steel wheels. Nice! I’m on 285s now and was thinking of going to 235s. A local member near me is selling 4.88s so might do that as well and bump up to 35s. Wish the 235s filled the wheel wells nicer on the 2nd gens. Decisions decisions. Anyways here a pic of my truck. It ain’t that old yet but one day it will be! I love regular cabs! You could do 255s instead of 235s. My friend has 255s with 4:88s on his regular cab. He’s pretty happy with that setup, though he has to wring out his engine a little more than me on the highway. Pics of my 85 SR5 efi xtra cab. In the process of doing rear brakes and wheel cylinders. did the extra cab second gens ever come with a 6' bed? I'm planning my next build but I'm 5'11" and want something I can sleep straight in the bed of instead of an angle. Awesome truck, just my style. @DJB1 home run on the wheel and tire combo on a great single cab. Stellar. This is my barn-find 2nd gen 4runner with 175xxx on the clock, getting about 16 MPG mixed, on 32's. Spacer lift and a rebuilt 3vz because the $1500 truck came with a couple g's worth OEM engine parts. This thread is great, thanks to everyone who has posted so far. Just because I don't want this awesome thread to go into the abyss, I'm giving it a bump.